This post has been read 1484 times! On February 25th, newly elected Manhattan Borough President Gale Brewer, City Councilwoman Margaret Chin, and Chris Curry of the Howard Hughes real estate company, presented before the Community Board 1 meeting. They announced that Ms. 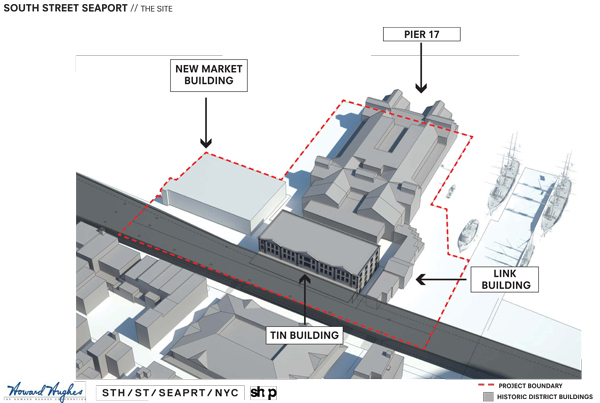 Brewer had created a “Seaport Working Group” to evaluate the Howard Hughes plans to erect a 600-foot apartment tower near the base of the Brooklyn Bridge, and demolishing the historic “Tin Building” of the Seaport. Under the Bloomberg administration, the Howard Hughes tall tower plan was gaining momentum, angering hundreds of local residents in opposition. The opposition’s argument was that the New Market building and “Tin Building” are historic and worthy of preservation, even though they lack official protection as historic landmarks. After 11 weekly meetings, the working group presented for the first time last week the guidelines that they expect Howard Hughes to respect. However, the guidelines are non-binding, and the City Council and City EDC will have final say in an up or down vote once the ULURP is submitted. The sixth guideline is all that matters. It addresses whether a tall tower should be allowed or not. 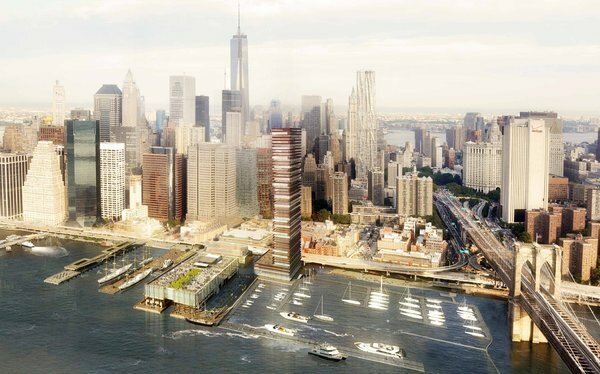 It states, “Alternatives to the proposed 50-story tower should be sought and any new building should be contextual with the buildings within the South Street Seaport Historic District”. Mr. Curry from Howard Hughes has indicated that a tall residential tower is financially essential in order to make the entire project feasible. Supporting his assertion is the fact that the old Pier 17 shopping mall, located in the same location as the new plans, has failed and is being demolished now. The City EDC will be the next crucial agency to weigh in on the fate of the Seaport. Under the Bloomberg administration, the EDC, headed by Kyle Kimball, supported the Howard Hughes tall tower, and the project was steaming ahead until Ms. Brewer put the brakes on. However, Mayor de Blasio retained Mr. Kimball to lead the EDC. Once the ULURP gets to the city council for a vote, the key member there is Margaret Chin, and she supported last year the rezoning of the area to allow for a tall tower. The most vocal city council member opposed to the tall tower was Gale Brewer, who is now the Manhattan Borough President and has no binding vote in the matter. The bottom line is that Mayor de Blasio has the power to influence city council to either support or reject the tall tower. 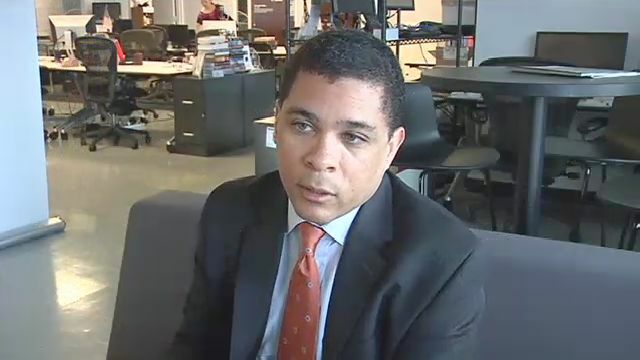 The EDC is under his command, and the Speaker of the City Council, Melissa Mark-Viverito, has been supportive of the de Blasio administration. The Howard Hughes Corporation has shown no interest in negotiating the matter, or offering amenities, such as a school to be constructed within the building. Likewise, councilwoman Margaret Chin did not support a school being part of the plan, when asked by BatteryPark.TV in February (see video). The CEO of Howard Hughes Corp. is David Weinreb, who works from a Dallas, Texas office. The Chairman is hedge fund billionaire Bill Ackman, who owns approximately 10% of Howard Hughes through his investment company. This entry was posted in - City government, - Community Board 1, - Downtown oversight, - Real estate, Seaport, Wall Street. Bookmark the permalink.